While climate change gets most of the media attention these days for the dramatic effects it is predicted to have — and, in some cases, is already having — on coastal communities, it has yet to have serious effects on eastern forests. Eventually, say local experts, climate change will likely cause a shift in the composition of tree species in the region, due in part to southern species moving into the area and the arrival of new pests and pathogens, which may reduce the abundance of currently common species. The predicted drier weather conditions will also likely play a role in altering woodlands. But Rhode Island’s forests are already facing what some say is an even greater threat than climate change: an overabundance of deer. That’s the warning from foresters, biologists and ecologists from throughout the Northeast, who say that even without climate change, Rhode Island’s forests are in trouble unless the state’s deer herd can be reduced and managed more effectively. 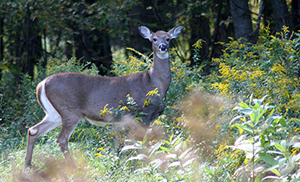 According to forester Marc Tremblay, outreach coordinator for the Rhode Island Forest Conservators Organization, deer have had a dramatic impact on forest understory by feeding on young trees, shrubs and plants.